Grafenberg, 07/05/2013. RAMPF Tooling, a RAMPF Group company and leading developer and manufacturer of high-quality Polyurethane, Epoxy and semi-finished products for model, mold and tool making, presented its novel and sustainable solutions and products for the foundry industry at a special pattern maker symposium in Düsseldorf. A key focus was on the casting system RAKU-TOOL® PC-3458/PH-3958, which is especially suited for face casting in large series production. The use of plastic materials in the foundry industry has a number of advantages when compared to conventional materials. They are easier to process, cheaper than metal tools, weigh less and reduce process time. They meet the main requirements for products used in the foundry pattern production: high abrasion resistance, a superior dimensional stability as well as good chemical resistance against release and binding agents, easy processing as well as uncomplicated repair and changes. 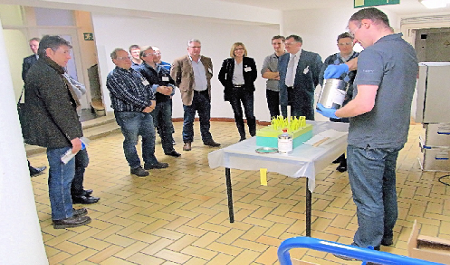 Thus the response of the participants to the RAKU-TOOL® foundry products presented by RAMPF Tooling was very positive. Approximately 20 visitors from the foundry and modeling industry attended the event held at the headquarters of the German Association for the Foundry Industry (Bundesverband der Deutschen Gießerei-Industrie, BDG) and learned more about RAKU-TOOL® casting systems for full and face casting for the easy and fast production of models, molds and tools. In addition, Dr Udo Pohlmann of Hüttenes-Albertus Chemische Werke GmbH, the internationally leading producer of chemical products for the foundry industry, held a lecture on technical application tests of sand and binding material resistance of core and mold making products. At the center of the symposium was the new RAMPF Tooling polyurea casting system RAKU-TOOL® PC-3458/PH-3958, developed for face casting in large series production. After abrasive wear of the surface the undersized cores made out of metal or plastics can be recoated. The face casting process is generally used for the production of pattern plates or core boxes in large series. The backing structure can be adjusted to suit individual requirements for the mold production. The most effective way to process the material is through just one downsprue using a mixing, metering and dispensing machine, but it can also be cast by hand using several downsprues. The latter was presented to the guests at the symposium. During processing, the material, negatives and molds are pre-heated to around 40°C. The excellent final properties of the system are obtained through a post cure over night at 40 °C. A further, significant aspect of the polyurea casting systems from RAMPF Tooling are their sustainability. For years, the RAMPF group has only been developing and producing gelcoat and casting systems that do not require a skull and crossbones label. Furthermore, the successful RAKU-TOOL® quality product range is continuously redeveloped in the RAMPF Innovation Center in Grafenberg to meet new market and customer requirements. “The dialog with our customers is important to us,” emphasizes Holger Fleisch.